In this episode, the eight digidestined cope with their lack of control by sitting down and projecting all their problems onto the new girl. Daigo meanwhile projects all his onto the eight digidestined. Without a doubt, the character under the biggest spotlight and with the most scrutiny in this movie is Meiko. Her predicament is fully examined, her flaws as a digidestined are acknowledged, and nobody else has such a defined character journey leading up to her big decision at the end. But when you think about who the main players are here, the field broadens. After all, while Meiko’s climactic choice is significant, there are plenty of other things in this ending that take priority. The easiest way to reconcile that is understanding that all of Meiko’s problems really aren’t about Meiko. 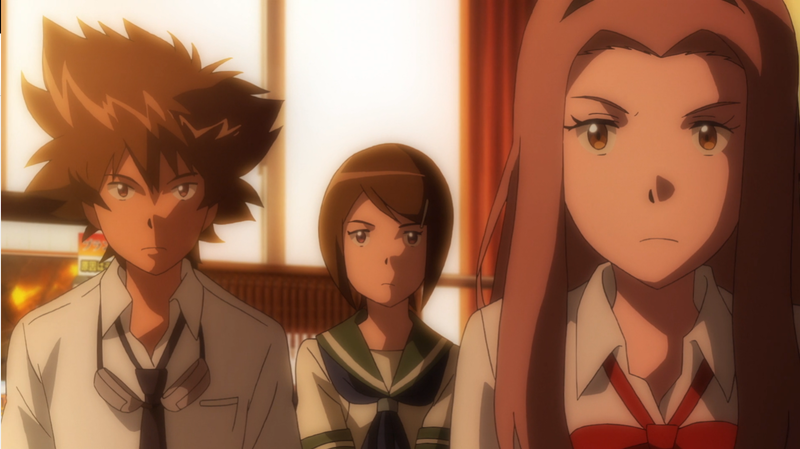 All throughout tri., most of what Meiko and Maki face have direct parallels to at least one of the eight digidestined. Maki forgets what it’s like to be a kid while Joe grapples between childhood and adult responsibilities. Meiko and Takeru both know more than they let on about their partners’ states, screwing over the team. Maki and Sora respond to a rebooted partner that doesn’t care for them anymore. 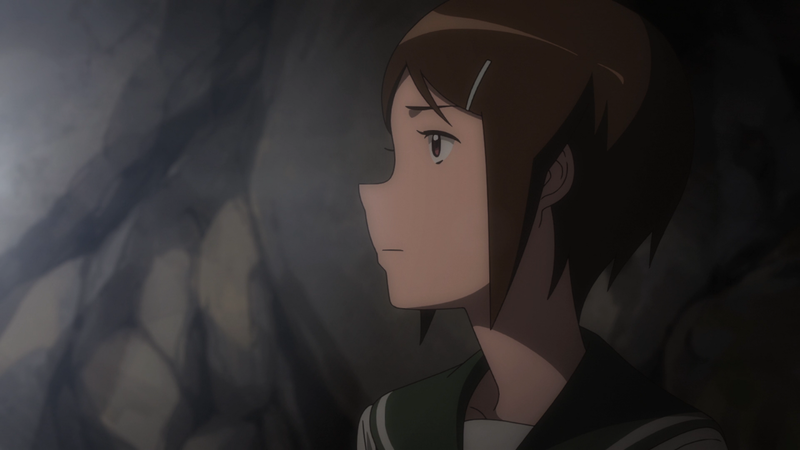 While Maki’s situation now drifts towards Hikari, Meiko now faces something all of them have contended with- being burdened with an unfair, impossible responsibility and feeling totally inadequate for the job. These kids have something to say about that! The two scenes exploring this are best appreciated by ignoring Meiko and focusing on everyone’s responses to her. Sora espouses the dangers of bottling up her feelings (the way she always did). Yamato presses the need for them to solve all of their problems together (the way he often forgot). Hikari steals the scene with a long speech of encouragement, pointing out how even if she thinks her heart is weak, it’s strengthened by having faith and friends to share in her burden (the way she’ll completely abandon soon). It’s a touching reminder of how far they’ve all come, and how even a situation as desperate as Meiko’s doesn’t feel insurmountable to them anymore. While this relentless optimism begins to feel self-destructive as Meicoomon spins farther out of control and their unity puts them at odds with Homeostasis, leave it to these eight to keep their chins up despite the growing danger. Hikari’s words show how she’s portrayed in Coexistence. While movies have introduced the problems for their featured characters then saw them resolved, Hikari’s issue is so massive it pushes the story into the final chapter. Instead we get these reminders of who she is and what she stands for. She’s a supportive team member and pushes the others to be their best. She’s also more in tune to the atmosphere of the Digital World than the others, likely due to the entity in her head she’s increasingly at odds with. We miss out on the single big thing that really matters (and a subtle reminder would have helped), but the picture we get suggests that she’s stable in spite of everything in her head. If Meiko’s actions aren’t as important and Hikari’s story doesn’t truly start until the end, the two goggleheads take up the helm as main players. It’s the first time we’ve seen Daigo taking an active role, and his motivation is clear. Hackmon’s announcement that Homeostasis will be taking care of Meicoomon its own way is, by nature, a slap in the face. It’s throwing all of the digidestined under the bus and leaving them hanging, particularly insulting since they used to be the entity’s way. Now, when their impossible task starts to actually look impossible, they’re deemed ineffective. Daigo starts asking really good questions about why they were entrusted with these impossible tasks in the first place. For all the perks of having a Digimon partner, the psychological damage is awfully severe. Daigo ends up taking action, ensuring the kids’ security upon their return, realizing that nobody else is going to. 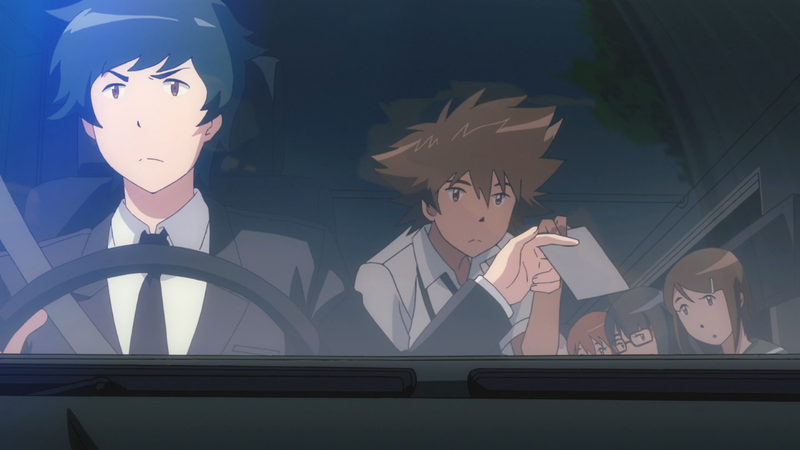 As for Taichi, everyone’s following his lead, even when it draws more police attention than necessary. At least he’s the most diplomatic during the ensuing interrogation. Faced with Meicoomon’s opening blow and troops around the world, Taichi’s looking at some massive collateral damage. All of the reservations he had in Reunion come back into play, and this time he’s lucky to have them. He recognizes that charging head on could lead to global disaster and they really do need to consider their options. This time he’s the one winning this argument with Yamato. This was an important subject to revisit, mostly to prove Taichi’s head was close enough to the right place. Also to remember that this side of him exists given everything else he’s going to do. While it felt like the right time for the Digimon to interrupt, Agumon waking up asking about food felt like a stretch. For all the work tri.’s done with Gomamon, Piyomon and Tailmon, Agumon feels more single-note than ever. Hackmon describes Meicoomon as mutating instead of evolving, claiming that it can’t be evolution if it only has a destructive element. While that sounds out of place when you consider the evolved villains we’ve seen, Homeostasis is out to ensure a balance between light and dark and will absolutely welcome darkness to the world as long as it doesn’t go too far. What kind of conversation did Hackmon or Homeostasis have to get the SDF mobilized per their needs? Did Hackmon show up in a meeting room or was it a really awkward Skype conversation? The lack of a reminder that the Digimon were rebooted feels off, but knowing they were makes their insistence that they want the digidestined to stick around in the world all the more heartwarming. That bond isn’t automatic now, but they still want to follow these kids around. Anyone get some episode 21 vibes when they returned to the real world? The kid with the ball was a nice touch. Maybe it’s me, but there was something badass in the way Daigo announced his full job title to the police? It’s screams “I’m more important than you” even though it’s plain to see he’s pretty low on the bureau’s totem pole. Also, Daigo nodding along during their talk about hope suggests at least that he’s found his people. At most, with Maki being his team’s Hikari, he might be their Takeru. Labels: Daigo, Kari, Meiko, movie, Tai, tri. Also, I think it's absolutely criminal we don't get to see Hackmon talking to the SDF brass. If only so we could see how he convinced them to listen to & trust his (Homeostasis') plan. And yes, I 100% got episode 21 vibes from their return to the real world.